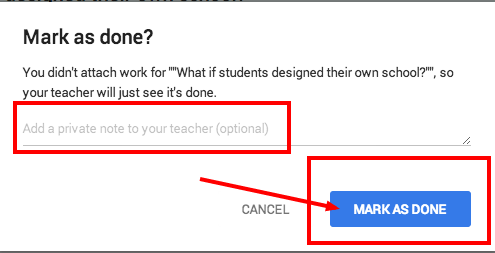 If you use Google Groups, you now have the ability to pre-populate your students in Classroom using your existing Google Groups. This makes adding students to your Classes even faster (as if inviting students via the code wasn’t fast enough for you). You may want to check with your domain administrator to be sure you have access to this feature. Often times, teachers assign their students to watch a video, read an article, or prepare for a class activity. In these cases, students don’t have anything to technically turn in, yet in the first iteration of Classroom, students were seeing “Late” next to these types of assignments. With the Classroom update, students now have the ability to mark assignments as done even if they have nothing to submit. Once they do this, they receive a “done” notification in the stream next to the particular assignment. Below are several screenshots from the student perspective with the new update. Note: when I tested this, I had to refresh the page to see the notification that the assignment was done. Students may have to do the same. Student receives a notification after selecting “MARK AS DONE.” Students still have the ability to add a private note to the teacher. Now teachers have the ability to download grades for all assignments at once, making it easier and faster to export assignments to any grade book. With the latest updates to Classroom, teachers have greater control over how conversations take place in the stream. Teachers can set permissions for whether or not their students can post or comment in the stream. 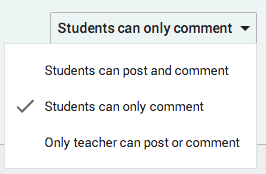 Individual students can now be muted from posting or commenting and teachers can even view previously deleted items in the stream; comments, assignments, etc. 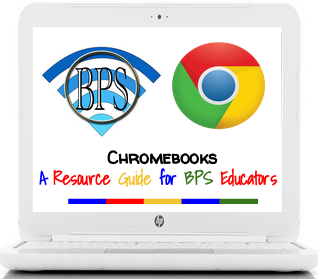 The brief screencast below provides you with a walkthrough of the new features in Classroom. I’m confident this is the first of many more updates to come, as it is clear Google is listening to teacher feedback and values what we have to say. That being said, please consider giving Classroom a try. It continues to be a simple, yet powerful workflow solution for educators who are looking for ways to become paperless and it is especially suitable for teachers who assign written work via Google Docs. The commenting feature in Docs allows you to be paperless, but more importantly, gives you the ability to provide students with feedback throughout the entire writing process.